Daniel McElravy was born in Ireland about 4 April 1798, based on his death date and age at death. The will of Robert McElravy (1807-1859) names Daniel and Hugh as Robert's brothers. Therefore, as summarized in the introduction, I believe that Daniel was the son of Hugh C. McIlravy and arrived in New York aboard the Brig Mary on June 17, 1812. His father died in Washington County Pennsylvania about 1817. The first specific reference to Daniel that I am aware of is in the 1823/1824 tax valuation list for Strabane Township, Washington County, Pennsylvania, that listed him as a single free man. About 1824 Daniel married Mary Margaret McComb somewhere in Pennsylvania. No marriage record has been found. Their first son, John, was born in Pennsylvania about 1825. Their second son, Alexander was also born in Pennsylvania about 1826. In March 1828, Daniel & Margaret McElravy bought 160 acres in Section 33 in Archer Township, Harrison County, Ohio from Patrick & Margaret Dunleavy. The deed record lists them, at that time, as residents of Allegheny County, Pennsylvania. In 1832, Daniel filed a declaration of intent to become a U.S. citizen in the Harrison County Court. John W. McIlravy died 24 April 1851 and is buried in the Dickerson Cemetery in Harrison County. His age is listed in the Harrison County Cemetery books as 29 years, 3 months, and 20 days. It would appear that his age must have actually been 26 or 27 rather than 29. 2 Jan 1862: Petition to sell land - Margaret McIlravy; list of all heirs. Note: The birthplace listings for all of the children was a ditto mark under the Pa. for Margaret. Actually, all of these children were born in Ohio. Only John and Alexander were born in Pennsylvania. On 25 Dec 1861, Robert B. McIlravy married Eunice R. Giesey in Harrison County. In April 1862, Robert and Eunice sold Roberts 1/6 share of the 214 acres owned by Daniel's estate to his brother Alexander. Robert served in the Civil War - and was killed at Richmond April 2, 1865, near the end of the war. On 13 May 1865 Burnhart Geisey was named administrator of his estate. In Nov 1865, Eunice was named guardian of Robert E. McIlravy, their only child. Eunice R. McIlravy remarried to Samual Sloan in Harrison County, OH on 23 March 1876. Thomas Corwin McElravy and James William McElravy also served in the Civil War - both rising to the rank of Captain. By 1870, the 5 living children of Daniel and Margaret were fairly widely scattered. After the Civil War, James William lived in Ohio, Colorado, Iowa, and Missouri over a period of years - before settling in West Liberty, Iowa. On 15 December, 1868, he married Arabella Lewis in Cedar County, IA. Thomas married Agnes Jane Hamilton, daughter of James and Sarah Hamilton of Jefferson Co. OH on 10 Sept 1867, and lived in Harrison Co. OH in 1870. Alexander McIlravy was in Belmont Co. OH in 1870. Nancy Major was in Franklin Co. OH in 1870. Franklin Washinton McElravy was in Muscatine County, Iowa. Note: in the 1880 census Eunice, 39, is listed as the wife of Samuel Slaon in Belmont County, Ohio. In 1870 Thomas was in Short Creek Township, Harrison County. Note: Charles, the only child of Alexander and Elizabeth, died in 1870 and is buried in the Scotch Ridge Cemetery, Pease Township, Belmont County, OH. Franklin W. McElravy married Hodika M. Dickerson on Jan 24, 1867 in Muscatine, IA. In later records she is listed as Louisa. Note: One child, James A., age 6, is missing from the above census. C. C. McElravy married Tillie Heath on Sep 08, 1890 in Muscatine, IA. He later married Nina Pearl Lee on 13 May 1895 in Wyoming. The Jan. 21, 1886 issue of the Tipton Advertiser, Cedar County, Iowa included a list of "Resident Veterans" (of the Civil War). Frank W. McElravy was listed in Iowa Township. Franklin W. McElravy and most of the family moved to Butler County, Nebraska before 1890. Franklin only remained there for a few years at most since, later, the family remained in Nebraska while Franklin went to the northwest - then joined the Alaska gold rush. Apparently, Franklin first went to Colorado where he had a timber land claim in Logan County (Township 10 North, Range 49 West), near where his sons Isaac and Charles C. and nephew Charles H. McElravy later lived in Weld County. 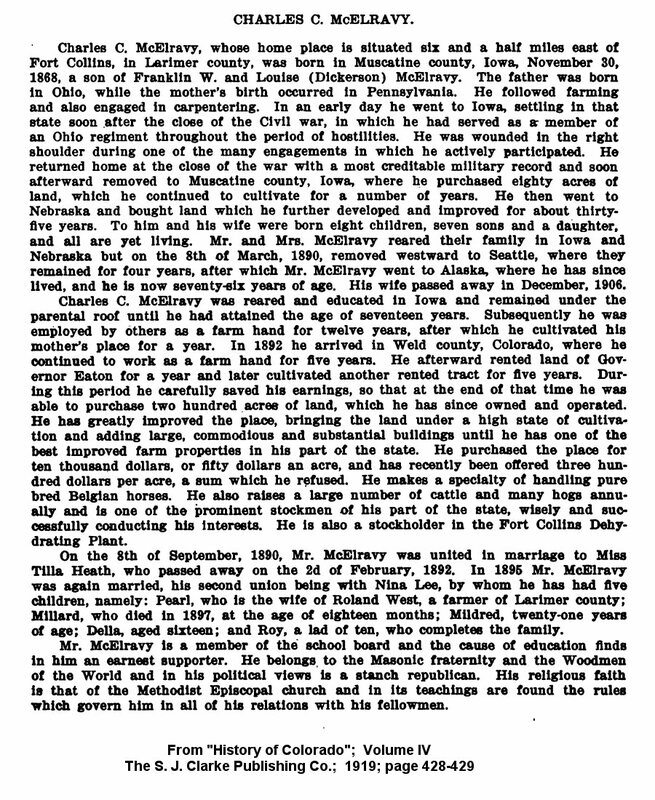 In a biography of their son, Charles C. McElravy published in the History of Colorado in 1919, it is stated that "Mr. and Mrs. McElravy reared their family in Iowa and Nebraska but on the 8th of March, 1890, removed westward to Seattle, where they remained for four years, after which Mr. McElravy went to Alaska, where he has since lived, and is now seventy-six years of age." While Franklin later went to Alaska - where he ended up spending the rest of his life, Louisa returned to Nebraska. At one time he apparently started out to return home with the gold he had accumulated - but was shipwrecked and lost everything, according to some of his descendants. He alledgedly was picked up by another ship and returned to Alaska. In the 1900 census, dated July 6, 1900, Franklin W. McElravy was listed in Porcupine Creek, Southern District of Alaska, age 57 at his last birthday, born Dec. 1842 in Ohio, father born in Ireland. He listed his home address as Tacoma, Washington, and had been in Alaska since April, 1897. He listed his occupation at home as a carpenter and his occupation in Alaska as a miner - in partnership with George Duke of Port Townsend, Washington - who had been in Alaska since 1889. After Louisa died (December 30, 1906) Franklin remarried in Alaska. In the 1910 census Franklin and Alo McElravy are listed as having been married within the past year. In both 1910 and 1920, they are listed living in the village of Haines, Alaska. Franklin was listed in 1910 as a miner, age 66 - born Dec. 1843 in Ohio, father born in Ireland, mother born in Scotland. His wife is listed as Alo, age 62 in 1910, born Jan 1847 in New York. In 1920 her parents birthplaces are listed as U.S. Some descendants state that she was an Alaskan Indian - but well educated. In the 1900 census, Louisa McElravy was listed on the farm in Union Township, Butler Co. Nebraska with four of her sons. She was also listed there in a Farmers Directory in 1906. James A. (Albert) McElravy and family were also listed in the same place in the 1910 census with seven children. Before 1910, John E. McElravy had moved further west to Dawson County, Nebraska, where he married Anna S. Wilkey. Before 1910, George E. McElravy had married Alma Lawver [probably daughter of Charles and Elizabeth Lawver of Reading Township] and was living on the McElravy family farm in section 7 of Union Township. The other two sons of Franklin W. and Louisa McElravy, Charles C. and Isaac O. McElravy had moved to Colorado - where they were in Weld County - and later in Larimer County. The 1910 census listings for these two families follow. Note the C.C. McElravy is listed as Clancy in 1910 and as Charles in the 1900, 1920 and 1930 listings. Note: Neighbors of this family in Weld County, CO in 1910 included the family of Charles H. McElravy, cousin of Isaac, son of Thomas McElravy. Note: John E. and Anna S. McElravy died in Dawson County and are buried in the Greenwood Cemetery in Lexington, Nebraska: John E. (1871-1926); Anna S. (1885-1945). In the 1930 census, George and James McElravy and their families were still living in Butler County (Alma was not listed and may have died before 1930 - two additional children - Leroy and Floyd were listed in George's household; three additional children - Lale, Richard, and Harold were listed in James' household); John had died in 1926 and Anna and two children were still living in Dawson County in 1930; William and Leslie (listed as Chester?) were living in Gage County, Nebraska. James W. McElravy hasn't been found in the 1870 census records. According to his biography, he may have been in Iowa or in Jasper County, Missouri. In 1880, he was in West Liberty, Iowa, where he owned and edited the local newspaper. Margaret, his mother, and a brother-in-law, Henry Lewis, were living with the family. James W. McElravy died in 1911. Several members of this family, including Margaret, are buried at the Oak Ridge Cemetery in West Liberty, Iowa. Note: The birthdate in the cemetery listing for Margaret is shown as 1779. However the gravestone lists the correct year (1799) and lists her age as 83Y 7M 4D. More about this family can be found in an 1889 Bio for J.W. McElravy. Note that there are some known errors in this bio. - and the accompanying paragraph regarding Daniel may not be accurate. The 1910 census for Mt. Pleasant Township, Jefferson County, Ohio, lists Elizabeth McIlravy, 74, b. OH, parents born PA and OH. To-date, we have found no cemetery listings for Alexander or Elizabeth. Thomas McElravy and his family were still in Jefferson County, Ohio, in 1880. In 1900, Thomas was living in Jefferson County with his son Robert and daughter Sarah Belle. Thomas McElravy was killed by a train in 1906 at age 72 while walking on a railroad near Unionvale, Ohio according to a newspaper article. However, his tombstone lists a death date in 1907 and birth in 1842 - while the 1900 census lists his birth date as August, 1840. The roll of the 74th Ohio Volunteer Infantry - Company G, lists his Civil War service record: McElravy, Thomas C, Captain; Entered 22 Jan 30, 1862; Served 3 years; Appointed 1st Lt Feb 18, 1862; Promoted to Captain Feb 10, 1863; Discharged Sep 20, 1864. In 1930, Robert McElravy, 60 and Bella (Sarah Belle) McElravy, 58, sister, were still living in Smithfield Township, Jefferson County, Ohio. Belle died June 4, 1940 at the Massillon State Hospital in Massollin Ohio. Her birth date was listed as December 25, 1868 - and her parents as Thomas McElravy and Agnes Hamilton. In 1910, Ulysses Grant McElravy and Charles H. McElravy, the other two sons of Thomas and Agnes, were in Nevada and Colorado. Charles Henry McElravy died in Larimar Co. CO, on November 6, 1950 and is buried at Garandview Cemetery at Ft. Collins. In 1920, Grant McElravy was living in Rusk County Wisconsin with his wife, Myrtle and son Charles. His brother, Charles, age 48, was also living with him and listed as divorced. In 1930, Grant, age 57, and Myrtle were still in Rusk Co. WI. The California death index lists Ullysis Grant NcElravy, b. 5 Aug 1863, d. 15 April 1954. His mother's maiden name is listed as Hamilton. He is buried at Sunset Memorial Park, Eureka, Humboldt County CA. In 1880, Eber and Nancy Major were still living in Brown Township, Franklin County, Ohio. Nancy McElravy Major died on May 21, 1891 and is buried in tha Alton Cemetery in Franklin County, OH. Her gravestone lists her birthdate as November 30, 1831. Eber Major died October 28, 1891 - birthdate listed as June 18, 1828. In 1900, their son, John Major was married and living next door to several of the unmarried children - with Oscar Major listed as head of that family.